iv got a i5/GT 525M normal use "media/net" my temps do not hit over 55c just searching the net it down to 45c. what is the highest acceptable temp for gaming? i looked up on nvidia web site but could only see the 560m has a 110c maxs but just cant find anything on the GT 525 M which is what im looking in to. Depends on your comfort level. Laptop parts are generally rated to run hotter than their desktop counterparts due to the generally inferior cooling available in laptops. For my own use, I prefer to keep my lappy under 75C at max load. iv done some mods to the laptop with 4 ram heatseeks on top of the GPU. Now iv got the GPU temp down to 85c in game play. I know i could just lower graphic setting in games but i like seeing games graphics at the highest i can do. i'm using arctic silver 5 paste so in time this should lower temp by 2c to 3c only time will tell if the nvidia chip will last. Have you tried a cooling pad for your laptop? yes been using the cooler master plus iv mod that for max's air flow. very limited laptop cooling really. I have an Acer laptop that I picked up and thay sucker gets pretty hot just running netflix. I ise to have a pad but the kids used and I don't know were it is. Time for a new one I guess. heat is a killer to any pc/console. 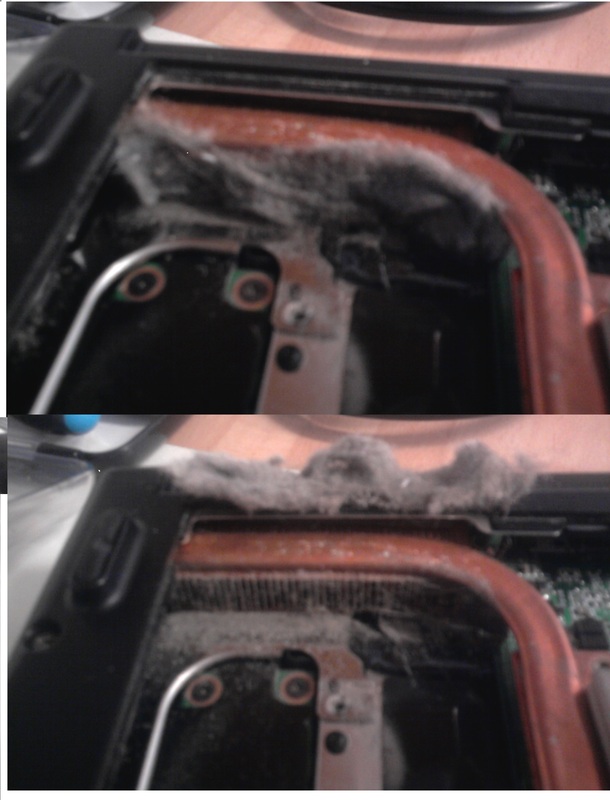 if a laptop is over a year old and never been cleaned out then the dust would block the fan from doing it job. At worst could destroy the parts by over heating. Most common thing is a slow system that lags and can cut off at random times. Manufacturer love this fact as then know the system will be fine for a year. If they supplied a removable dust filter this would increase the life time of laptops a lot. 95% of laptops i repair has a block of dust you can peel off the heat seek in one go!!! A "block of dust," ugh! here just one laptop that needed cleaning out due to over heating and slowing the system down!!! The owner lucky to have it slowing down really. some laptop just fry's the chip to death. The conductive cooling pads are not advisable for laptops that have fan vents built into the bottom as the cooling pad blocks the vents leading to overheating or premature system failure. The best way to determine if a cooling pad would be suitable for your laptop would be to take a look at the bottom of the laptop and look for air vents or fan vents. One thing I like to do it grab a can of air and a vac and back flow those heat sync's I usually get a ton of crap that comes out of the bottom. use a cooling pad. I am using a cooling pad for my laptop so I don't worry to this kind of problem now.